Captured, tortured and separated from the only man she’s ever loved, Isabelle is fighting for her life and will do whatever it takes to survive. Little does she know that Braxton is too. Injured and weak, Braxton’s life hangs in the balance. He seeks the help of his closest friend to help him save the girl he loves. When he can no longer trust those around him, will Braxton be able to find Isabelle or will it be too late? 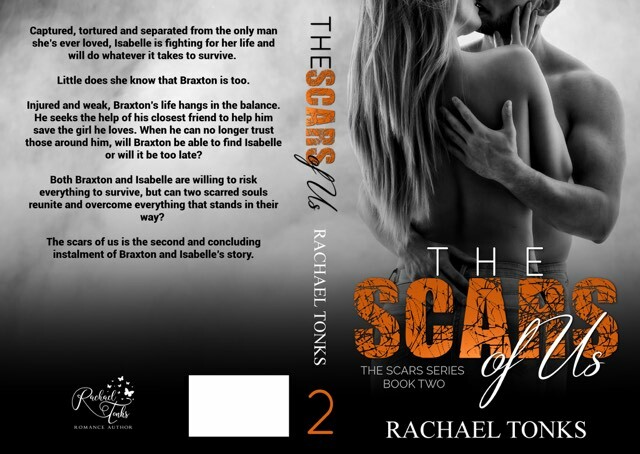 Both Braxton and Isabelle are willing to risk everything to survive, but can two scarred souls reunite and overcome everything that stands in their way? The scars of us is the second and final installment in the scars series. Rachael Tonks is a contemporary romance author with a love of books, and a particular love of the romance genre. As a child, Rachael could always be found with her head in a book, but it wasn’t until the beginning of 2015 when Rachael’s love of books really took over. Reading spurred on her desires to put pen to paper, and write down the story of the characters screaming for their story to be told. Starting out her career with a new adult romance novel, she has now published multiple novels, ranging from dark romance to contemporary. Rachael lives in the steely suburb of Sheffield, in the north of England with her family. She has 3 beautiful children and a crazy dog. She loves nothing more reading with a good cup of tea and is a self-proclaimed chocoholic!